Measuring the distance from one star to another in the sky is easy when you master using your hands to measure the degrees between objects. The width of your little finger is about one degree—enough to cover the moon and sun, both of which are each half a degree across. The width of the first three fingers side-by-side spans about five degrees. A closed fist is about ten degrees. If you spread out your fingers, the distance from the tip of your first finger to the tip of your little finger is 15 degrees. If you spread out your fingers, the distance from little finger to thumb covers about 25 degrees of sky. Measuring degrees with your hands. With a bit of practice, this hand system is endlessly useful when measuring your way around the sky. Everyone's hands are slightly different, so you might want to practice and calibrate your own hand measurements using the Big Dipper. The Big Dipper is a great starting point for learning the night sky. Being circumpolar, it never completely sets or dips below the horizon—it's visible in the night sky year-round! The Big Dipper itself is not a constellation, but it resides in one called Ursa Major, the Great Bear, the third largest of the 88 constellations. The name originates from the dipper-shaped pattern formed by the seven main stars in the constellation. In autumn, the dipper appears to be sitting flat. In spring, the dipper is upside-down, spilling its contents. In summer, it sits upright on its bowl. In winter, it sits up on its handle. 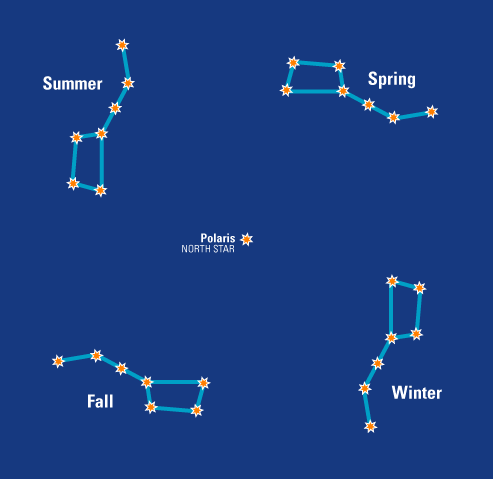 The Big Dipper through the seasons. The stars of the Big Dipper are a handy guide to other stars, constellations, and other thought-provoking objects that may be too faint to spot with the naked eye. Using well-known spots in the sky to find fainter ones is known as star hopping—think of it as an astronomical treasure hunt! And one of the easiest and coolest place to start is with the two end stars that form the front of the dipper's bowl—they point straight to Polaris, the North Star. All the other stars in the sky seem to turn counterclockwise around Polaris. Polaris itself marks the end of the handle of another pattern, the Little Dipper in Ursa Minor, the Little Bear. If you find Polaris, you know which way is north. Following the arc of the handle of the Big Dipper points to two of spring's brightest stars—Arcturus and Spica. With a bit of practice, it's surprisingly easy to imagine lines and arcs from star to star and hop from constellations you know to those you're still learning. The Big Dipper points the way. The trick to successfully learning the night sky is to use easily recognizable star patterns to find the more difficult ones—just like we used the Big Dipper's stars to find Polaris. Don't try to learn the entire sky on your first night out. Begin by learning the major constellations and then search out the more obscure patterns as the need and challenge arise. Like riding a bicycle, once you know a constellation, it's hard to forget it.